We headed over to Pho Ong Tay (39 Vo Truong Toan, Thao Dien, D2; 090 246 2934), for a late lunch. I knew little about Pho Ong Tay, only that they specialized in Italian and Vietnamese food—pho and spaghetti. Pulling up outside the first thing we noticed was how much vegetation cascaded over the brick exterior. Once inside, plants are placed all around the small, but airy room, adding to the welcoming setting for the eight mosaic-tiled tables and bar-style seating in front of the windows. Inside were touches of Italian brickwork, with the open wall space covered in the day’s specials and drink lists written in chalk. The décor offers a homey, relaxed atmosphere. Before we ordered Italian chef Manuel greeted us. He works alongside the owner and his future wife, Trang. Affable and enthusiastic, Manuel was proud to tell us the ingredients he uses are all natural—no chemicals, no MSG and no emulsifiers— and how he makes everything from scratch, from the breads, cakes and pastries to the pastas and sauces. As he put it, “I’m Italian, we don’t compromise with food.” Trang proudly added that Manuel is a trained five-star chef, but he humbly shrugged off the mention. 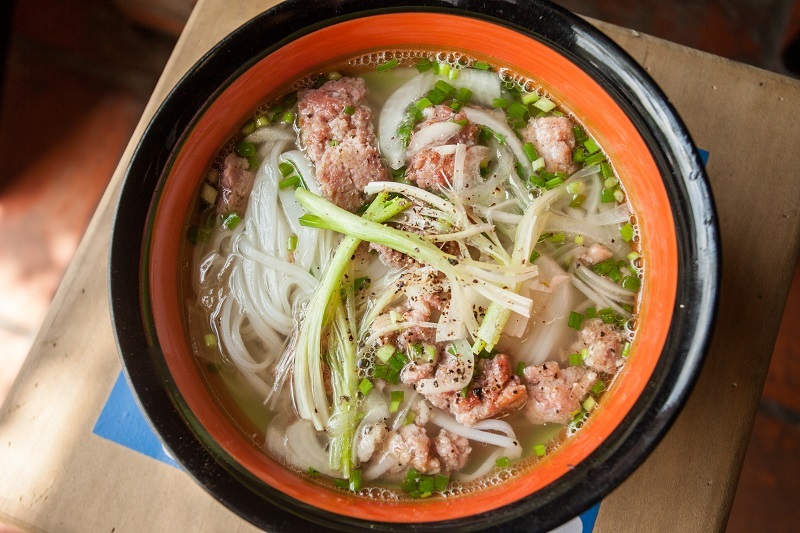 When it was time to eat we started with one of their fusion dishes, pho topped with Italian sausages (VND85,000). It’s just like it sounds, a traditional bowl of pho, with the usual leafy greens and sauces, with an Italian sausage, which Manuel said is the only thing he doesn’t make. The sausages are sourced from an Italian chef who hand makes them here in Saigon. The unexpected flavor of the sausage complemented the pho and broth. This first dish whetted our appetite and we were excited to sample more of Manuel’s quirky pho pairings, like the pho samurai with tempura shrimp and zucchini, the pho luc lac and pho tom yum (VND85-VND95,000) at our next visit. The piadina sandwich was next to leave the kitchen and arrive at our table. 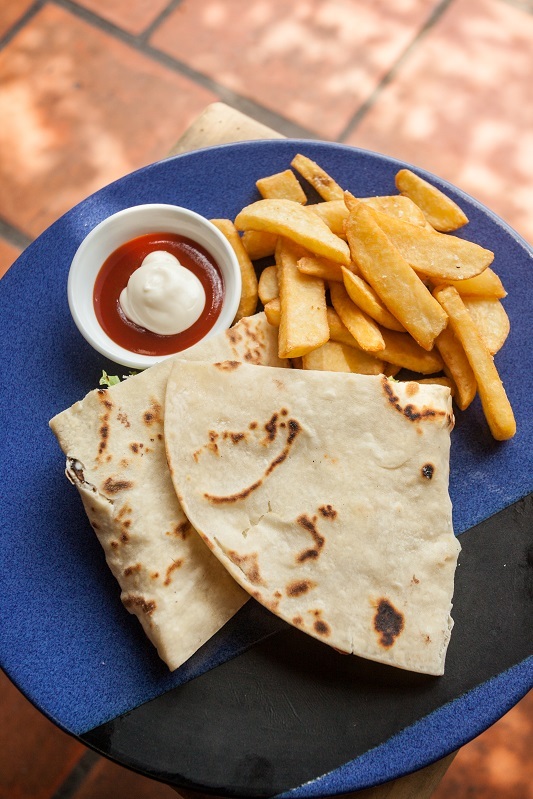 Piadina is a thin Italian flatbread, and I had the Ducati, which has parma ham, fresh mozzarella, tomato, lettuce and mayo and fries (VND150,000)—a delicious meal in its own right. 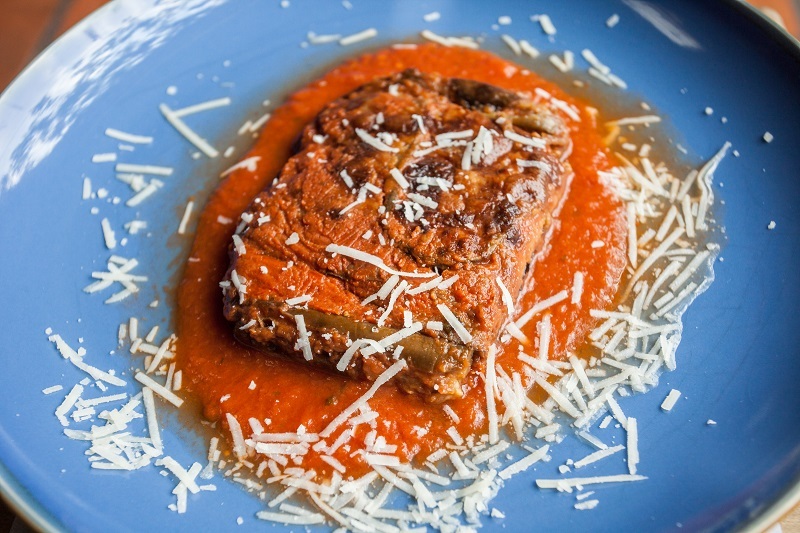 After that came a crescendo of traditional Italian dishes. 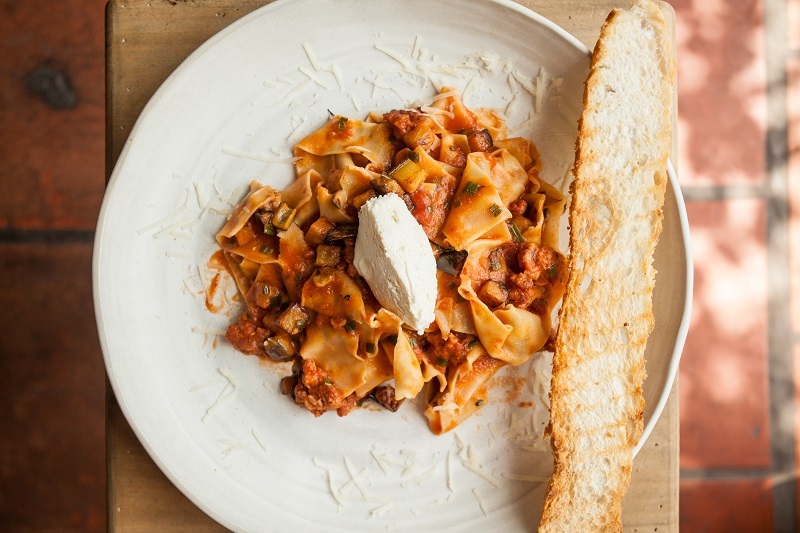 First, pasta pappardelle with fried eggplant and spicy sausage in tomato sauce with a dollop of fresh ricotta cheese on top (VND140,000). This was something special, eliciting some audible oohs and aahs. For the pasta dishes at Pho Ong Tay, diners can choose the type of pasta, and then separately the toppings and sauce. 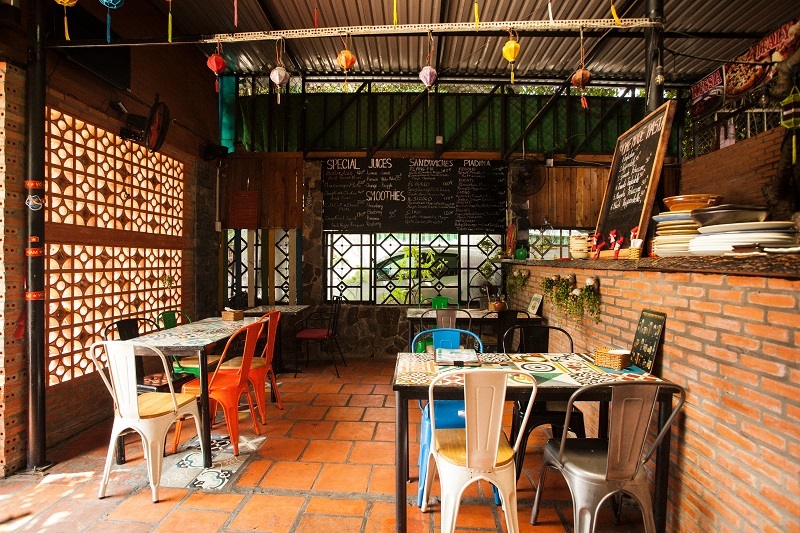 They typically have at least eight housemade pastas available (VND45-VND60,000), and a variety of sauces and toppings (VND70- VND95,000), like the duck ragout and vegetables in red wine sauce, or the stewed octopus in tomato sauce with garlic and basil. Next we had a plate of eggplant parmigiana (VND180,000). The tangy housemade tomato sauce really stood out, and I finished this despite how full I already felt because it was too good too delicious to leave behind. 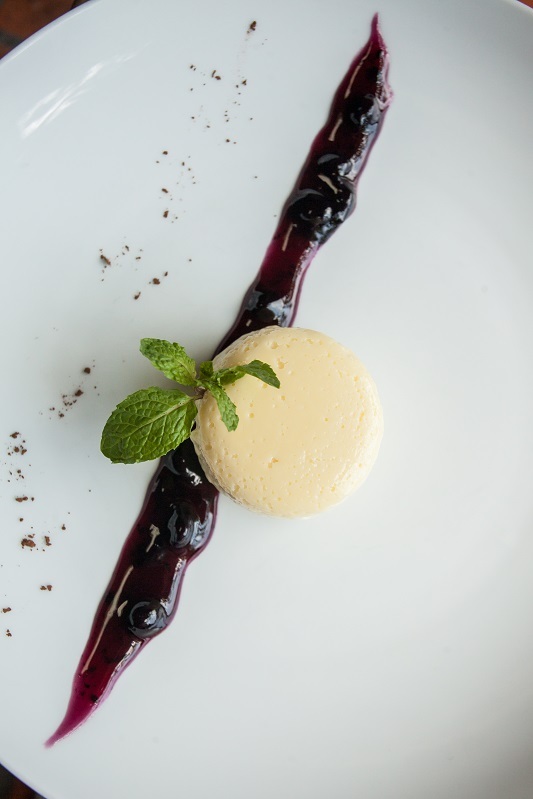 For dessert, we tried the cheesecake on biscuit butter crumble with blueberry sauce (VND55,000). It was incredibly rich and sweet, similar to the texture of a pudding, and I was running the fork over the plate for the last remnants of crumble and blueberry sauce. Pho Ong Tay also has a large drink selection, which includes imported Italian wines and grappa. Don’t let the name fool you, Pho Ong Tay is clearly more of a gastronomic experience than just a pho and spaghetti joint. For dinner on Friday through Monday nights, reservations are recommended. For more info, check out their Facebook page: phoongtayphospaghetticakes.